Be aware that spoiled food and overeating may cause diarrhea and other intestinal problems. 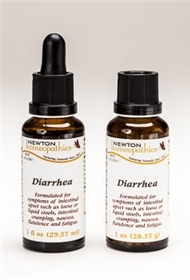 Take Diarrhea to relieve symptoms of loose stools, gas, nausea, lightheadedness, and weakness. Diarrhea may also cause dehydration and mineral loss. See a health practitioner if symptoms continue for a prolonged period. DIRECTIONS: Take 3 to 6 drops on the tongue every 15 minutes until symptoms abate. For infants give 1 to 3 drops or crushed pellets every hour. INGREDIENTS: Argentum nitricum, Arsenicum album, Baptisia tinctoria, Carbo vegetabilis,Colocynthis, Elaterium, Ipecacuanha, Iris versicolor, Lycopodium clavatum, Podophyllinum 15x. Aesculus hippocastanum, Juglans regia, Tabacum, Vaccininum myrtillus 3x. Alcohol 20%.